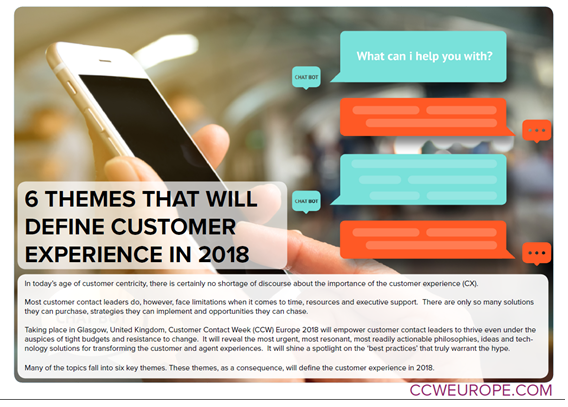 WHAT THEMES WILL DEFINE CUSTOMER EXPERIENCE IN 2018? In today’s age of customer centricity, there is no shortage of discourse about the importance of the customer experience (CX). Most customer contact leaders do, however, face limitations when it comes to time, resources and executive support. There are only so many solutions they can purchase, strategies they can implement and opportunities they can chase. But which of these solutions, strategies and themes will define customer experience in 2018, that you should be focused on now? In conjunction with Customer Contact Week (CCW) Digital we have written this article exploring the 6 most prominent opportunities you should be taking advantage of and how you can do just that!